The first post of this series tried to convince you of the wisdom of learning to make seamless tubes and circles. Today's post examines the theory What is the theory behind the voodoo of double pointed needles, as well as magic loop. The traditional way of knitting small tubes or circles is with 4 or 5 double pointed needles (dpn's). But nobody has that many hands, and the thing looks horribly complicated. The alternate non-traditional method--using one very long circular needle--a method called "Magic loop"-- also looks complex. Given how un-intuitive these methods seem, there must be a pretty good reason why they're so popular. So what is that reason? What's with all those needles, all those darn loops? The deal is this: double pointed needles (dpn's) allow your knitting to choose its own natural diameter. This is true whether you are knitting a pass-through tube (sleeve) or a dead-end tube (hat, sock, mitten)--or any flat circle (lace shawl, hat top)--on dpn's these items all get to find their natural diameter without any stretching. 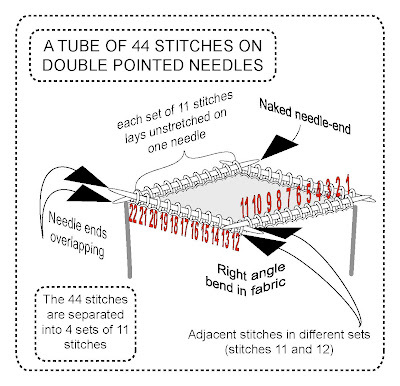 An example: per the illustration below, if you have a tube of 44 stitches, and you put that on four dpn's, you'll have 11 stitches on each of the four needles, right? Each SET of 11 stitches can just sit in the middle of its own personal needle, taking up exactly 11 stitches worth of needle-room. The stitches in each set never need to stretch their way down the length of the needle. Any unused lengths of needle just turn into naked needle ends sticking out PAST either end of the set. As a result, the tube gets to hang down from the needles in its natural shape--at its natural diameter. Now, the thing is, the naked needle ends on the dpn's are free to overlap one another as much or as little as necessary. That's what makes the dpn system so very flexible. 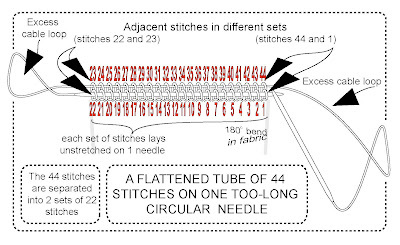 On the illustration below, if you were to increase one stitch per set--so you had 12 stitches on each of 4 needles, each needle would have less naked needle-end, and more of each needle would be taken up with stitches. In this way the tube would remain free to find its own diameter. So it all boils down to this: stitches on dpn's don't have to stretch ALONG the needle--the excess needle just sticks out. That means there's no gap between the stitches of one set. But, how about the gap BETWEEN sets? Let's look at the gap between stitch 11 and stitch 12 in the above illustration. It is true that two needle ends are sticking out of this gap. However, although there is a right angle bend between them, stitch 11 (the LAST stitch of one set) and stitch 12 (the FIRST stitch of the next set) aren't really any further apart from one another than if they were two stitches in the SAME set. In other words, they're just as close to one another as they would be if they were on the same needle. See: the knitted fabric is flexible, bends readily and easily accomodates the right turn between each set of 11 stitches, while the naked needle ends overlap as much (or little) as they need to, to keep adjoining stitches from different sets right next to each other. Bottom line: with dpn's, there is no stretching between stitches in the same set, nor between stitches in adjoining sets. The dpn's let the tube you're knitting find its own diameter, and any excess length of needle just sticks out PAST the stitches. Of course, the whole thing looks like a porcupine, with all those naked needle ends sticking out. And that is especially so when you're just starting a center-start garment with a very few stitches. However, within that ferocious-looking nest of needle ends, the tube or circle lays very nice and tidy and most of all it lays peacefully UNSTRETCHED. We now pass on to the trick of knitting with a too-long circular needle. This trick was popularized in a booklet which named the technique "Magic loop" knitting. The booklet, available on the web, and probably at your LYS, came out around the same time as modern circular needles which feature a well-attached and flexible cable. This technique is a needle-ruiner for the older type needles with stiff nylon cables, which will kink or break at the cable-needle joint. Oh wait--one more thing before we jump in. I expect you are wondering why this trick even developed--after all, it seems sort of odd to create a small seamless tube with a too-long needle. Why not just use an itty-bitty teeny circular needle in the first place? Actually, there ARE tiny needles touted for making little tubes--needles 8 inches long and 12 inches long. However, for many knitters, a needle that short is hard to manipulate. The needle tips have to be very short or the cable wouldn't be long enough to wrap around the back, so you have to hold the needle tips with your finger tips. OK, now we come to the theory of the technique. The deal with a too-long circular needle is this: by popping two loops of cable out between two sets of adjacent stitches, the stitches separate into two sets in a flattened sort of tube. As with dpn's, disassociating the length of the needle from the amount of room each set of stitches takes up, allows the stitches in each set to sit unstretched, taking up exactly as much needle-room as they need. In other words, in the same way that the naked needle-ends protrude past the ends of the stitch sets in dpn's, so unused part of the cable needle protrudes in loops past the ends of the stitch sets in this technique. Because the cable loops are free to stick out of the fabric as far or as little as necessary, this allows the tube you are knitting to find its natural diameter without stretching around the circumference of the circular needle. The cable loop which pokes out between sets is theoretically flexible enough so that stitches in adjoining sets are no further apart than stitches along the same needle in the same set, and the knitted fabric is theoretically flexible enough to take the 180 degree bend between the front and back set of stitches without distortion. In actual practice, you may find that there is distortion along the line between the front and the back sets of stitches. Like every other aspect of knitting, personal preference trumps all. For me, magic loop, with its flattened, doubled fabric, is a perfect match for creating objects which are used flat and doubled--classic ski hats, diamond-shaped potholders, christmas stockings. This is partly because magic loop tends to distort the fabric slightly along the fold line making it a good match for objects which will stay folded, and partly because with magic loop, it is so easy to visualize what the finished project will look like since you knit it in the same shape as it will be used. Other than for folded, doubled objects, I don't use magic loop much because I find it slow to have to stop and re-arrange the needles twice on every round--that'd be every 30 or 40 stitches on a sock, for example. In my hands, double pointed needles are much faster. However, as is evident in the comments, this is utterly a question of preference. Some knitters find that magic loop is quite a bit faster than dpn's, and more convenient, too: easier for travel, less likely to lose needles, no need to own multiple sets of needles. It's knitter's choice, and after a few iterations, you'll know which trick works better for you.